The United States was founded as an “infant empire,” in George Washington’s words. The conquest of the national territory was a grand imperial venture, much like the vast expansion of the Grand Duchy of Moscow. From the earliest days, control over the Western Hemisphere was a critical goal. Ambitions expanded during World War II, as the US displaced Britain and lesser imperial powers. High-level planners concluded that the US should “hold unquestioned power” in a world system including not only the Western Hemisphere, but also the former British Empire and the Far East, and later, as much of Eurasia as possible. A primary goal of NATO was to block moves towards European independence, along Gaullist lines. That became still more clear when the USSR collapsed, and with it the Russian threat that was the formal justification of NATO. NATO was not disbanded, but rather expanded, in violation of promises to Mikhail Gorbachev that NATO would not even fully extend to East Germany, let alone beyond, and that “NATO would be transforming itself into a more political organization.” By now it is virtually an international intervention force under US command, its self-defined jurisdiction reaching to control energy sources, pipelines, and sea lanes. And Europe is a well-disciplined junior partner. Throughout the expansion of US Empire, Latin America retained its primacy in global planning. As Washington was considering the overthrow of the Allende government in Chile in 1971, Nixon’s National Security Council observed that if the US couldn’t control Latin America, how could it expect “to achieve a successful order elsewhere in the world?” That policy has become more severe with recent South American moves towards integration, a prerequisite for independence, and establishment of more varied international ties, while also beginning to address severe internal disorders, most importantly, the traditional rule of a rich Europeanized minority over a sea of misery and suffering. In July 2009, the US and Colombia concluded a secret deal to permit the US to use seven military bases in Colombia. The official purpose is to counter narcotrafficking and terrorism, “but senior Colombian military and civilian officials familiar with negotiations told The Associated Press that the idea is to make Colombia a regional hub for Pentagon operations.” There are reports that the agreement provides Colombia with privileged access to US military supplies. 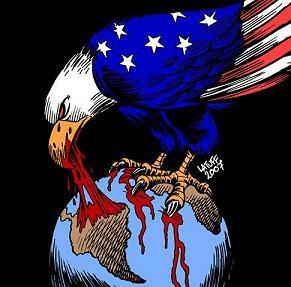 Colombia had already become the leading recipient of US military aid. Colombia has had by far the worst human rights record in the hemisphere since the Central American wars of the 1980s wound down. The correlation between US aid and human rights violations has long been noted by scholarship. AP also cited an April 2009 document of the US Air Mobility Command, which proposed that the Palanquero base in Colombia could become a “cooperative security location” (CSL) from which “mobility operations could be executed.” The report noted that from Palanquero, “Nearly half the continent can be covered by a C-17 (military trans- port) without refueling.” This could form part of “a global en route strategy,” which “helps achieve the regional engagement strategy and assists with the mobility routing to Africa.” For the present, “the strategy to place a CSL at Palanquero should be sufficient for air mobility reach on the South American continent,” the document concludes, but it goes on to explore options for extending the routing to Africa with additional bases. Militarization of South America is a component of much broader global programs, as the “global en route strategy” indicates. In Iraq, there is virtually no information about the fate of the huge US military bases, so they are presumably being maintained for force projection. The immense city-within-a-city US embassy in Baghdad not only remains but its cost is to rise to $18 billion USD this year, from an estimated $1.5 billion USD last year. The Obama administration is also constructing mega embassies that are completely without precedent in Pakistan and Afghanistan. In short, moves towards “a world of peace” do not fall within the “change you can believe in,” to borrow Obama’s campaign slogan. Noam Chomsky is an internationally renowned linguist, scholar, writer, and activist and author of more than 80 books. He is the most quoted person in world history. This article was first published in the 12 March 2010 issue of Orinoco International.